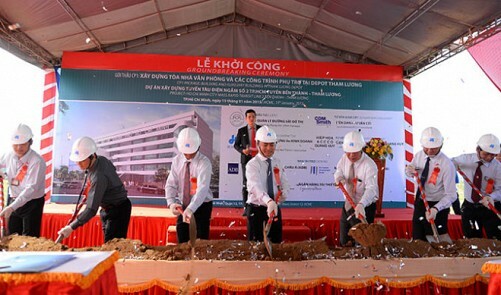 The Management Authority for Urban Railways (MAUR) and Hoa Binh Construction and Real Estate Corporation (Hoa Binh) broke ground for the control building and other components of Metro Line No. 2 in the city. Hoa Binh is the main contractor for the architectural structure, mechanical and electrical facilities and technical infrastructure of the project’s first package. This package comprises an eight-floor control building worth $8.1 million and auxiliary works at Tham Luong Station and will be implemented within one and a half years. The building will be used for operation and management of the city’s second mass rapid transit rail line and help MAUR and consultants set up and install equipment for the metro project. Work on Tham Luong Station finally got off the ground after six years of fence erection and site clearance. As initially planned, the track would be completed in 2017 and put into test-run in the following year. However, it has been rescheduled to 2019 for competition and 2020 for operation due to slow site clearance. The 20-kilometer Metro Line No. 2 connects Thu Thiem New Urban Area in District 2 and Tay Ninh Coach Station. In the first phase, the city will develop an 11-km section running from Ben Thanh Market in the downtown area to Tham Luong Depot in District 12, including a 9.3-kilometer underground track section along Cach Mang Thang Tam Street. The project was originally estimated to cost $1.37 billion, but the city told the Ministry of Transport that the cost should be revised up to $2.1 billion due to inflation and design change.